(Hunt Valley, MD) — (December 17, 2018) – Diamond Comic Distributors is excited to reveal the artwork for the commemorative artist T-shirts available for Free Comic Book Day 2019. Award winning artist and illustrator, Derek Charm, has created a one-of-kind Star Wars-inspired design for this year’s Free Comic Book Day (FCBD) 2019 T-shirt. The T-shirt is available for pre-order at comic book shops starting December 28 and is featured in the January issue of Diamond’s PREVIEWS catalog. Derek Charm is an Eisner Award winning artist and illustrator who has done work for Marvel, Lucasfilm, IDW Publishing, Archie Comics, and Valiant Comics, as well as providing illustrations for children’s books and a comic-inspired 2015 Spring/Summer line for Marc by Marc Jacobs. His distinctive animation-inspired art style can be seen in Star Wars Adventures, Squirrel Girl, Power-Puff Girls, Archie Comics and more. In 2017, Derek Charm won an Eisner Award for Best Humor Publication for Jughead. 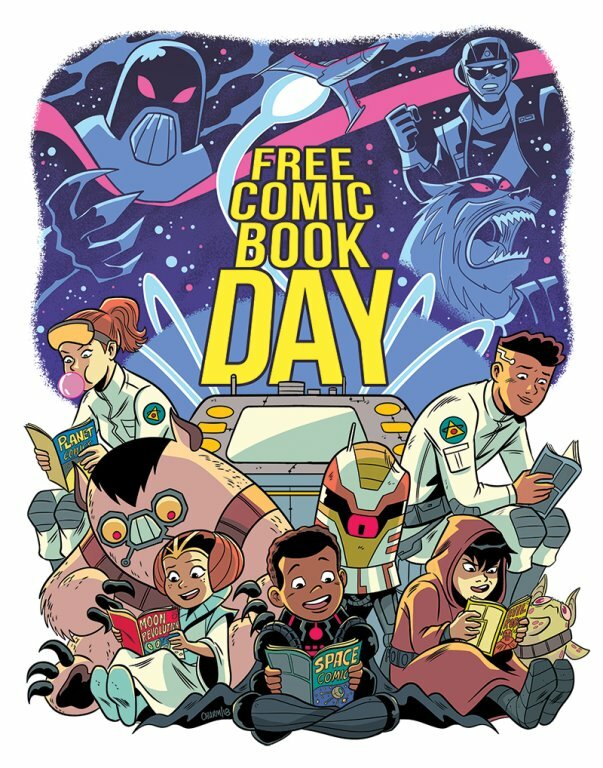 Charm’s artwork for the FCBD 2019 Commemorative T-Shirt captures the spirit of both comics and comic book shops, and highlights that—whether you’re at the local comic shop, at home relaxing on the couch, or chilling on a space station far, far away—everyone loves to read and enjoy comics! The FCBD 2019 T-shirt will be available in black and heather gray in men’s and women’s sizes (MSRP: $14.99-$17.99) as well as youth sizes (MSRP: $11.99). The shirt, along with a complete listing of all the FCBD 2019 comic book titles, can be found in the January issue of PREVIEWS, available in comic shops on December 28. For more FCBD news and updates, visit www.freecomicbookday.com and become a fan on Facebook and follow us on Twitter and Instagram!